If you plan to buy a treadmill, make sure you are clear about what you want from it and how you’ll use it. Here are some guidelines. Step 1: Check out your objectives, both long term and short term. (b) Are you going to run regularly to lose weight and stay trim? (c) Are you likely to train for a 7-21km run? (d) Are you likely to train for a marathon? Step 3: Know the speed at which you are currently running and make sure the maximum speed of your treadmill is around twice that pace, so you can continue speed training. 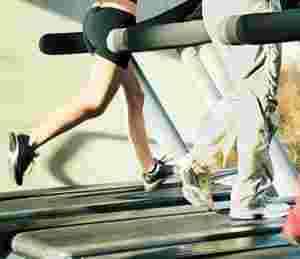 Most starter treadmills come with maximum speeds of 12kmph, which may be a bit slow. It’s preferable to look at one that goes up to around 16kmph (or 10miles per hour), and if you are looking to push yourself a bit, then look at 20kmph. Step 5: Study the display. Meters showing speed, distance, incline and calories burnt are the minimum you will need; the rest are extras. Avoid getting carried away by things such as programmable schedules and pulse monitors—the programmes are seldom used, and if you are really serious about monitoring your heart rate, go for a more accurate and separate monitor, with chest straps which link to a watch. On the other hand, it is always good to have a slot for a water bottle. Try the machine out regularly in the first week after installing it. Check all functions to see that everything is working well. 1. Place it in a well-ventilated area with enough light and a fan overhead to dry your sweat. You tend to dry off naturally when you run outdoors, even on a still day; but you need to take precautions indoors. 2. Place it away from the wall but near a window. If possible, have a mirror nearby so you can check your posture and form as you run. 3. If you want, you can have a music player in the room and/ or a TV at eye level to accompany your run. 4. Identify the speeds at which you can run and carry on a conversation comfortably; at which you can sprint 400m; and at which you can “race" 5km. Use these regularly for your speed training workouts. 5. Keep the treadmill at an incline of one degree to replicate running outdoors. I prefer to keep my treadmill at a 2-degree incline. Use greater inclines to practice running uphill. 6. Follow a training schedule—at least initially—so that you are varying your workout every day and using different muscles. 7. Yes, you have a treadmill . But make an effort to run outdoors at least once a week. Often we become slaves to the display and say “I cannot run faster than 8.3kmph" or “I can’t do more than 3km at a stretch". Look away and dash for that tree—you might surprise yourself.